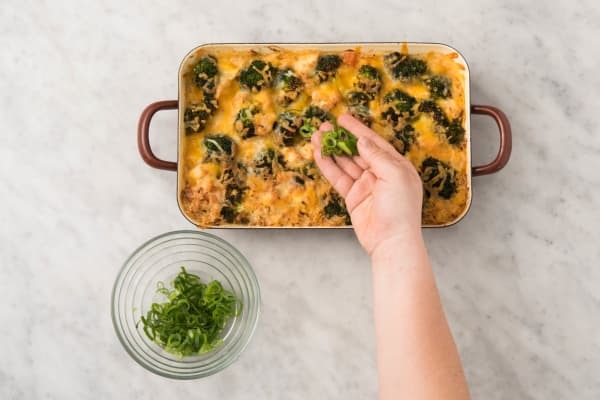 Broccoli and cheddar have a famous friendship—they always taste great together. But these besties also know how to play well with others. Here, they let in chicken and creamy rice for some fun. 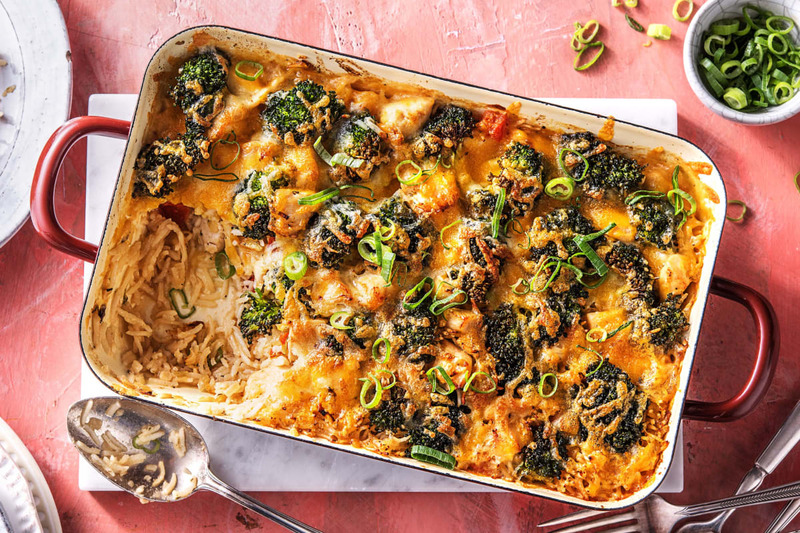 Everything is all cooked together in one pan, including the last step where it gets baked to melty, bubbly perfection. There’s so much fun, flavorful goodness going on, it’s practically a party. Wash and dry all produce. Adjust rack to upper position and preheat oven to 425 degrees. Halve, peel, and finely dice onion. 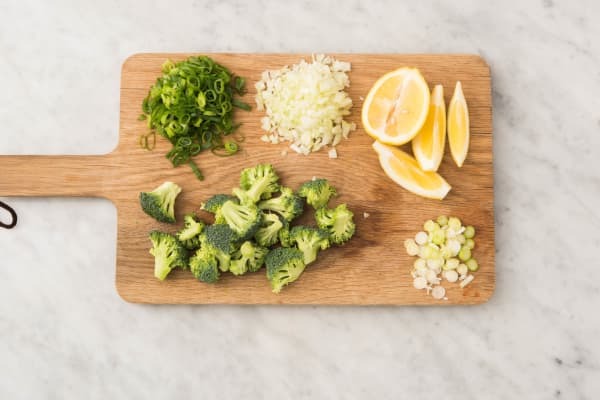 Cut any large broccoli florets into bite-size pieces. Trim, then thinly slice scallions, separating greens and whites. Core tomato, then cut into ½-inch pieces. Halve lemon; cut one half into wedges. Pat chicken dry with a paper towel and cut into 1-inch pieces. 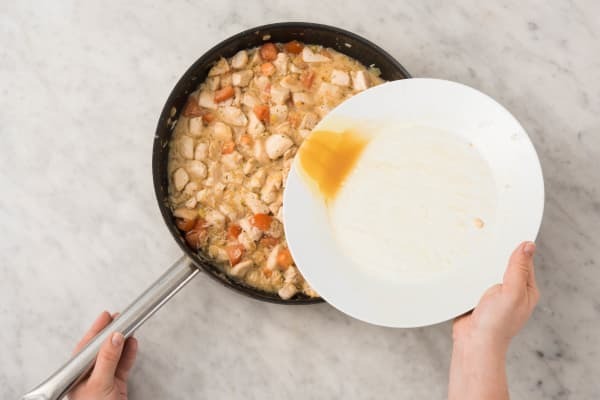 Heat a large drizzle of oil in a large pan over medium-high heat (use an ovenproof, lidded pan if you have one). Add chicken and season with salt and pepper. Cook, tossing often, until browned all over, about 5 minutes. 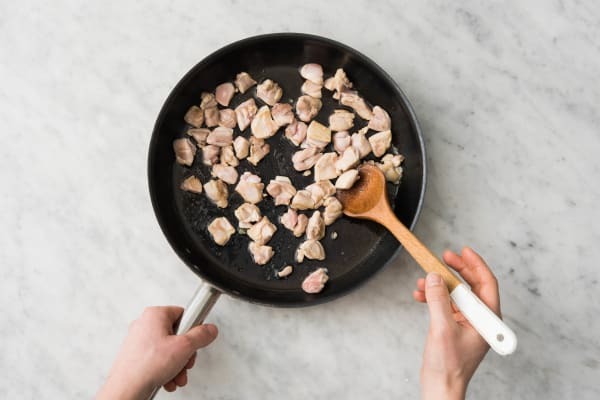 Remove from pan and set aside on a plate. Add another drizzle of oil and 2 TBSP butter to same pan over medium-high heat. Toss in onion, scallion whites, and Italian seasoning. Cook, tossing, until onion is softened, 2-3 minutes. 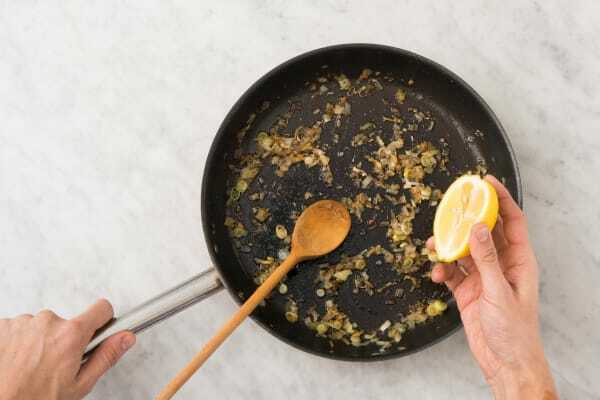 Squeeze in juice from lemon half and scrape up any browned bits from bottom of pan. Stir stock concentrate, demi-glace, and 1 cup water into pan. Add milk and bring to a boil, then season with salt and pepper. Stir in rice and tomato. Lower heat and reduce to a simmer. Stir in chicken along with any resting juices on plate, making sure to keep rice submerged. TIP: If your pan is not ovenproof, transfer mixture in pan to a large baking dish at this point. 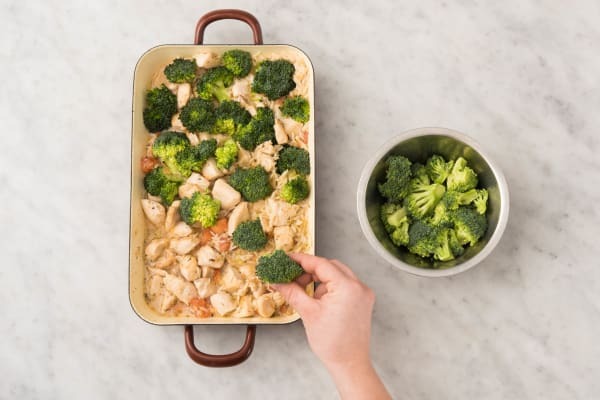 Arrange broccoli on top of contents of pan or dish, pressing down gently to partially submerge florets. Cover pan tightly with a lid or aluminum foil and transfer to top rack of oven. Bake in oven until rice is just al dente and chicken is cooked through, about 15 minutes. (TIP: It’s OK if the rice on top looks dry—it will continue to cook.) Remove pan from oven and heat broiler to high or increase oven temperature to 500 degrees. Sprinkle Italian and cheddar cheeses over casserole. Place in oven or beneath broiler about 3 inches from flame. Broil until cheeses are bubbly, about 3 minutes. Once done, sprinkle with scallion greens. Let cool about 5 minutes before dividing between plates. Serve with lemon wedges for squeezing.